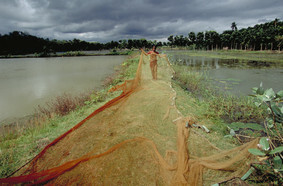 A woman prepares a fishing net for mending in Hamidpur, Bangladesh. In just over a month, policy makers from around the world will meet in Rio de Janeiro for the United Nations Conference on Sustainable Development. The meeting has been called Rio+20, reflecting the two decades that have passed since a landmark conference on the environment and development was held in Rio in 1992. This time the main themes are energy, sustainable cities, food security, water shortages, the health of oceans, disaster readiness and assuring people a livelihood. Bangladesh is a prime example of a vulnerable developing nation that faces formidable challenges in all these areas, and it will be directly affected by the decisions that are made — or not made — at the conference. Firm commitments have often been elusive on the international level. We asked Thomas Rath, the country program manager for the United Nations International Fund for Agricultural Development project in Bangladesh, about the development obstacles the country faces, some of which are linked toclimate change and environmental degradation. Following are excerpts, edited for brevity and clarity. How would you describe Bangladesh’s agricultural picture? Bangladesh, bordering India, Myanmar and the Bay of Bengal, is in the subtropical zone, very wet and flat and dominated by agriculture. Three large rivers from the Himalayas flow through the country, all ending in the bay on the southern coast. It’s a beautiful, fertile tropical delta. About 150 million people live here, and the population density is one of the highest in the world after places like Singapore and Hong Kong. That’s 1,200 people per square kilometer (about four-tenths of a square mile). By comparison, in Mongolia there are only three or four people per square kilometer. This density means that many farmers have very small land plots on which they struggle to feed their families. About 35 percent of the population lives under the poverty line of $1 a day, and about 40 percent, or 60 million people, are completely dependent on agriculture. Many people are landless or have less than an acre or half an acre to live on. It makes you wonder what they are surviving on. Rice is the principal crop and, for those with very little land, the only crop they grow. Forty percent of children are malnourished, either because they don’t get enough calories or because they can’t develop healthily only eating rice. How is climate change affecting the land, people and economy? 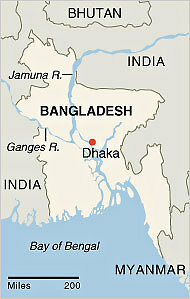 Bangladesh sits at the end of the cone of the Bay of Bengal. The country is infamous for natural disasters. Every year there are typhoons. The coastal zones routinely get washed away, and the farmland is destroyed: people lose animals, crops, everything they have. They are very exposed: most of the land is flat and just above sea level, every storm sweeps across the country without any obstacles, and tidal surges pound the coast. 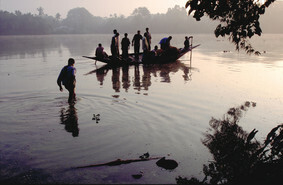 Fishermen begin their work at dawn in Dhopadanga Boar, Bangladesh. If you go further north, there is an area in the northeast that is essentially a large depression in the land. When the monsoon season starts, the water comes down from the mountains and floods the whole area. It fills up with water and takes months to drain. Vast areas are underwater half the time, so farmers can’t go into their fields or grow anything then; they have to rely on something else for most of the year. These things have always happened in Bangladesh, but with climate change it is expected that these flash floods will occur more frequently, and rainfall will be more intense and erratic. Farmers are already trying to adapt to these changes by sowing their rice earlier and using varieties that mature more quickly so they can get the harvest in before the rains come and they are left with nothing to eat or sell. In the coastal areas, storms are expected to come earlier and be more frequent and severe. In the last two decades, 500,000 people have been killed in storms, and we should expect that this will increase. And then of course, the sea level will rise, and the ocean will come in over what dikes have been built. It is very likely that about 30 percent of land in Bangladesh will frequently be underwater and the soil will be saturated with salt and useless. Many, many people will lose their farmland, crops and livestock and homes and become climate change refugees. Where do these people go then, when there is already not enough land in the country? What are your thoughts on Rio as the conference approaches? Are you hopeful? Cynical? I am not cynical — there are too many cynics already, and how does that help? But I do think it’s important that people act instead of just talking. It’s really sad that there are still politicians and governments out there who don’t believe that climate change is fact. It’s very sad. I don’t know what their motivations are, but they should come to Bangladesh and meet the people who won’t have homes or land or any way of supporting their families. If we don’t do anything, then the problem will come to us: these won’t be problems in our backyard, we will have climate refugees in our front yard, knocking on our door. These people have a right to live, just as we who by chance were lucky enough to be born in comfortable North America and Europe have the right to live. Rio was and is a fantastic thing, but we have no time to waste. The planet cannot afford for us to continue the mistakes we made during industrialization: rooting our economy in fossil energy and polluting the atmosphere as much as possible. We need to help one another. What are the biggest challenges for Bangladesh? It’s not enough for us to help people become better farmers; we need to help transition the economy to something that does not depend on the availability of land. I know farmers who grow rice before the monsoon season and then, when the rains come, they stock their flooded fields with fish fingerlings and crabs and sell these in Dhaka. It is a strange sort of crop rotation, but it works in some areas. Agriculture will still be a very important sector in Bangladesh — it has to be, given so much food insecurity. But food insecurity can only be tackled by sufficient food production, and expanding agriculture — livestock, rice cultivation — contributes to climate change, which in turn leads to greater food insecurity through flooding, etc. We need to find ways to help countries all over Asia to reduce carbon dioxide emissions while at the same time producing enough food to feed their people.